It’s one of the biggest stages in sport: soccer’s World Cup. Aside from the Olympics, the quadrennial gathering of 32 national teams competing in “the world’s game” is perhaps the most-watched sporting event on Earth. Consider: the 2016 game seven between the NBA’s Cleveland Cavaliers and Golden State Warriors drew 30 million viewers. More than 114 million watched Super Bowl 2015 between the New England Patriots and Seattle Seahawks. And 115 million tuned in for at least part of the 2016 World Series between the Chicago Cubs and Cleveland Indians. By comparison, about a billion viewers saw Germany defeat Argentina 1–0 in 2014’s World Cup final. Three billion watched the month-long tournament that played out across Brazil. When the 2018 World Cup comes to Russia in June, it’s expected to once again command those kinds of numbers. And tens of millions who tune in will hear alumnus John Strong (above left) calling many of the 64 matches. Strong’s rise to the peak of the sport is nothing short of meteoric. 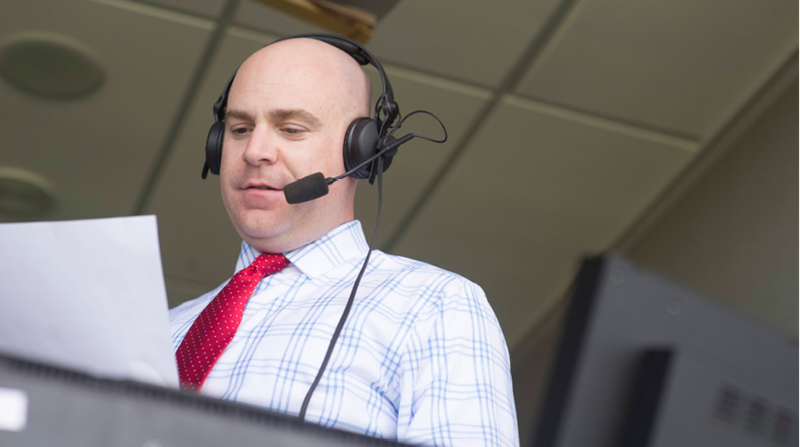 Within three years of receiving his journalism degree in 2007, Strong was doing play-by-play for the Portland Timbers of Major League Soccer (MLS). Two years after that, he moved to NBC Sports to cover MLS and the English Premier League, that country’s top league for soccer (or “football,” as the game is known internationally). 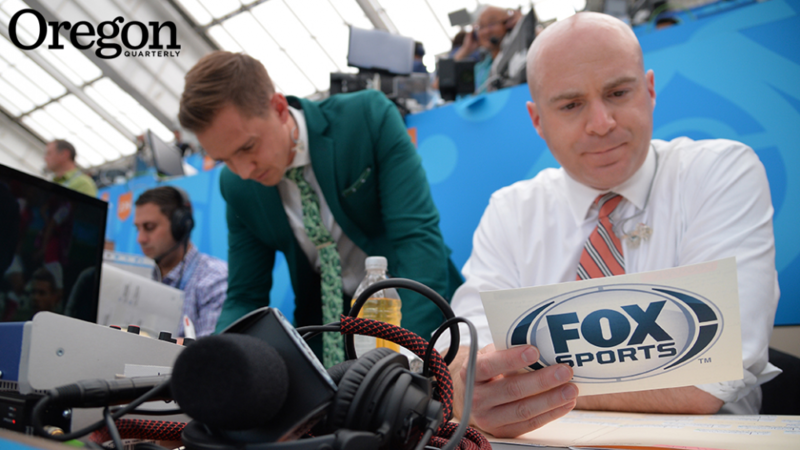 In 2014, Strong joined Fox Sports to head MLS and Women’s World Cup coverage; a year later, he became the network’s lead play-by-play voice for most US men’s national matches. His excitement is scarcely dulled by the fact that the one team about which he knows the most—the Americans—won’t be there, courtesy of a meltdown in qualifying matches. Strong’s challenge will be to make the games interesting—make the players interesting—for US viewers without any hometown heroes to watch. Fortunately, he has an ace up his sleeve: he’s a heckuva storyteller. Sportscasting breaks neatly into two categories, Strong says—how you call the handful of I-can’t-believe-what-I-just-saw moments that come your way and what you do with the other 99 percent of the time you’re on the air. A sportscaster’s career can be defined by making—or muffing—the big call. But Strong credits his rise in the field to what he provides during the long periods of airtime in between jaw-dropping plays—namely, rich back stories that bring the players to life not just as athletes, but as people. With the return of the World Cup, the camera will repeatedly find Portugal’s Cristiano Ronaldo and Argentina’s Lionel Messi, two of the most famous athletes on the planet; Strong must be ready with new stories about them that soccer fans haven’t already heard countless times. He has a few little-known gems in store, courtesy of exhaustive amounts of research. Whatever else other commentators might bring to a soccer match, Strong vows never to let anyone outwork him when it comes to doing his homework and finding a good story. This is music to Rebecca Force’s ears. One of the most influential figures in Strong’s education, the journalism instructor hammered home the importance of storytelling to the aspiring broadcaster and his classmates. Skim a long newspaper story—how would you condense it to 30 seconds of broadcasting brilliance? What would you include, what would you cut? How can you say it in as few words—as few seconds—as possible? And don’t think just about the story itself, Force lectured—think about how it’s told. Broadcasters must read from the teleprompter, which can leave them sounding robotic and impersonal. Her advice: Read the news as you’d tell it to your grandmother. At the same time that Force and other faculty members were teaching Strong how to be a broadcaster, he was cutting his teeth with UO sports. First, Strong and friend Erick Olson converted a half-hour KWVA sports radio show—Quack Smack—into an hour-long program with athlete interviews. Next came live broadcasts of games—women’s lacrosse, followed by softball and soccer. In 2006, Andy McNamara—an assistant athletic director at Oregon and director of athletic communications—was the voice of the Timbers; he helped Strong get an internship that eventually led to his breakthrough role as the team’s play-by-play announcer. Citing his own collegiate experience and the boost it has given to his career, Strong sees the UO as poised to join the leading sports-multimedia-journalism schools—Syracuse, Columbia, Northwestern—given its top-tier journalism school and thriving athletics department. In fact, Strong, a member of the alumni association who still calls Oregon home, envisions making that happen. Matt Cooper is managing editor for Oregon Quarterly.